With constant speculation about his retirement following the recent poor show, batting legend Sachin Tendulkar has given an indication that he may finally be ready to call it a day. He had a discussion with chief selector Sandeep Patil. “They had a frank discussion, and Tendulkar told Patil that since he is not getting runs, he would like to leave it to the selectors to take a call (on his retirement),” a cricket board insider told Hindustan Times. This comes in the wake of the crushing defeat India suffered against England in Mumbai. Tendulkar fell to left-arm spinner Monty Panesar in both innings, scoring only eight runs each time. In the first Test in Ahmedabad, he got out for 13. Though the national selectors made only one change in the squad for the Kolkata Test, replacing Umesh Yadav with Ashok Dinda, most cricket debates remain focused on Tendulkar’s retirement. The batsman, eight short of becoming the first cricketer to play 200 Tests, has not scored a century since the Cape Town match against South Africa in January 2011. Since then, he has gone 15 Tests, and 28 innings, without reaching triple figures. The little master, who will turn 40 on April 24 next year, also had a forgettable home series against New Zealand recently. Though India won 2-0, he was bowled in all three innings, with critics raising concerns about whether his legendary batting skills were waning. 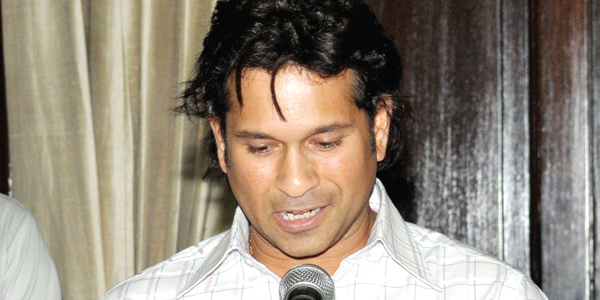 Patil’s talk with Tendulkar also puts on notice other players who have not performed consistently. Though the selectors were supposed to announce the 15-member squad on Tuesday for the last two Tests as well as the two Twenty20 internationals, they named the side only for the Kolkata Test, leaving room for more changes. Words of a small man with a big reputation.